Don't spend your day on the water looking for fish, "catch ya some" with Woods & Water Guide Service! Woods & Water Guide Service offers a comprehensive crappie fishing school that will provide detailed instructions and a vast amount of information on how to fish for crappie in the three stages of spawn (prespawn, spawn, and postspawn). This full day of fishing is packed with hands-on fishing and technical training that will help even the most novice crappie fisherman catch more fish. Receive instructions on water temperature and structure, live bait and jigs, colors, sonar readings and other secret methods used by the pros to find and catch crappie. 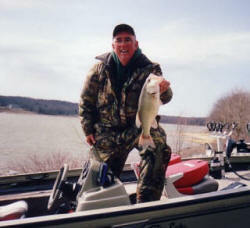 At day's end you will have the basics of catching crappie on your own and a day of fun on Kentucky Lake. The cost is $250.00 and is limited to one person. Class starts in October and runs through April.